Located among the most prestigious stretch of Peachtree in the heart of residential Buckhead, 2500 Peachtree offers beautifully landscaped gardens and balconies with wonderful views. With its grand European flair, roaming balconies and manicured gardens, this is a perfect home for anyone seeking class and opulence, rather than shining highrise towers. 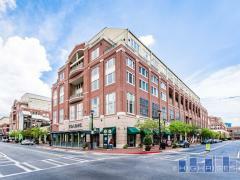 Have any comments or questions about 2500 Peachtree? Ask your question and/or share your thoughts about this Building.